The hottest Disney franchise since High School Musical is finally back on our screens this Friday, December 20. Descendants, the musical drama where the children of Disney’s villains take centre stage, returns this week with a vengeance. When Mal (Dove Cameron) starts to struggle with the perfect life in Auradon with Ben (Mitchell Hope), she seeks the comfort of home. 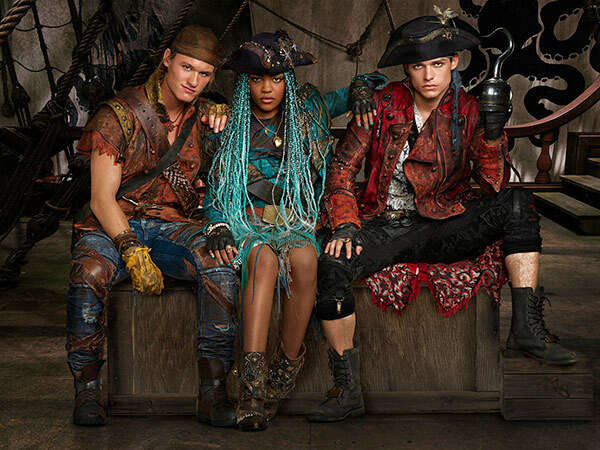 Little does she know that her old nemesis Uma (China Anne McClain) and henchmen Harry Hook (Thomas Doherty) and Gil (Dylan Playfair) have a wicked plan in store. It’s up to her friends Ben, Evie (Sofia Carson), Jay (Booboo Stewart) and Carlos (Cameron Boyce) to bring Mal home and convince her of the importance of staying true to one’s identity in this touching, all-singing, all-dancing sequel. We were lucky enough to sit down with the stars of Disney’s Descendants 2, Booboo Stewart and Thomas Doherty, about what’s changed since the first Descendants film, their characters and some crazy new stunts. Starting off with their characters, Booboo tells us that Jay, the son of Aladdin villain Jafar, has been through a lot of changes since the first film. While he used to follow in Jafar’s lead, Jay’s now evolved into his own person – and a completely different one to his father. On the subject of heartthrob new bad boy Harry Hook, Thomas admits basing the son of Harry Hook on a number of interesting real-life characters. Harry is the son of Captain Hook and a friend of Uma, the daughter of Ursula and enemy of Mal from her childhood in the Isle of the Lost. The teenagers who remained on the Isle harbour a lot of resentment towards Mal and her friends. It’s a journey that resonates throughout the new film. Uma is driven by the anger she feels about the select few kids allowed to live in Auradon. She lives and works at her mother’s fish and chip shop, where the musical number “What’s My Name?” is set. The video, which was released in June this year on YouTube, has accumulated nearly 80 million hits. The song was the first time Thomas has ever rapped, though he jokingly describes it as a “piece of cake”. It’s not the only new skill Thomas and the other actors have had to acquire. The new Descendants film is bigger and better than ever before, featuring a huge extended fight sequence aboard a pirate ship where all the characters engage in sword fighting. There’s one stunt he wasn’t particularly keen on, however. In the midst of the action-packed battle scene, Harry is forced to jump overboard.